Please read on before you actually start slapping ANYbody. It might not mean what you think it means. When you SLAP your significant other, you are treating them with the respect, the love, and all the best qualities you have to offer. SLAP, in this case, is an acronym. Most people want to be a "somebody." And most people want to be with someone who wants to be a “somebody.” We all have our dreams and aspirations, and whether we’re pursuing them with fervor or we’re just taking it a day at a time, we need someone who believes in us…especially on those days when we don’t believe in ourselves. I was in a relationship where I didn’t get supported at all. As an entertainer and motivational speaker, there were times when I would have to go to an audition or leave town for a gig. I was constantly pestered and beaten down, verbally and emotionally, about trying to do my dream. There were many auditions that I did NOT go to because she did not support me in my life’s ambitions. I wonder why that relationship didn’t work. On the other hand, I am now married to a woman who believes in me so much that on days when I am having a hard time (when the gigs aren’t coming in or I’m questioning my abilities) she’s there supporting me every step of the way. There have been times when I feel like I want to quit, but she won’t let me. That’s true love…that’s true support. I have heard people suggest that if you and your significant other say the words “I love you” too many times to each other that it will get old and you’ll stop believing it. I say that the only reason you would stop believing it is if you want to stop believing it. Here's a little secret that I use when it comes to telling my wife that I love her (I haven’t told her that I do this…although it seems she has figured it out, since she does it back to me all the time). When she tells me that she loves me, I tell her that I love her, too. Only I’ll add something to my reply to make sure she knows I'm not just saying it back...I really mean it. This makes saying sincere and genuine. Something simple like, “I love you, too…soooooo much! !”…or “I love you, too…I am so lucky to have you in my life! !”…or “I love you, too, Baby! !” (pet names are endearing, but if you want to make it especially intimate or meaningful, use their real name instead of the pet name). That’s just the beginning part of it. Love is more than just words. Love is actions. Love is an attitude. Love is a responsibility. Love means that you love everything about your significant other...even if he/she likes catsup and you don't. On our first date, my wife and I went grocery shopping (it wasn’t a planned date, but it happened all the same). When she bought catsup, it almost ended our future together…(just kidding)!! I am NOT a catsup guy!! The thing is, I AM a mayonnaise guy and she is NOT a mayonnaise girl. We really differ on our condiments. But I’m glad that I looked past that thick, red, gooey, nasty stuff and kept dating her anyway, because the best thing that I ever did in my life was marry her!! And now, the condiment situation is a source of fun and humor to us, which makes us love each other even more!! One of the big problems with relationships after the infatuation runs it's course and turns into a deeper kind of love, is that "sometimes," the deeper kind of love is a love for someone's "potential" and not necessarily for the actual "someone." This causes the person who SEES the potential to try to force (whether consciously or unconsciously, whether subtly or aggressively) the other person to live up to that standard. It also causes the person who is being forced, to question the love of the one who is trying to change them. "Don't they love me for who I am?" Not a good example of acceptance. And, if you don't mind my saying, that isn't really love, either. Music is important in my life. Sometimes I am moved by the way a song has been orchestrated, or how the lyrics and harmonies interact with each other. Sometimes it even makes me cry. I once dated a woman who got jealous of a song I was listening to…a song that got me emotional…she wanted to be the only one to make me feel anything…and the tighter her grip got on me…the more I wanted to escape. On the other hand, my wife loves the fact that I love people. She sees me make people laugh, she sees me hug other people, she sees me make other people’s lives better, she sees me get emotional about a song…and she accepts that about me…she adores that about me. I get to be me and I love her for that…and because she doesn’t have a suffocating grip on me, I’m more dedicated to her than I ever have been to anyone in my life!! I accept her, too and she knows it!! We all have our own little foibles, our own mistakes, our own faux pas, our own imperfections, and our own idiosyncrasies (I call them “idiot”-sycrasies) that we have to deal with. It is much harder to deal with them when your significant other is pointing them out to you all the time and making you feel worse about yourself. If you really love your spouse, you won’t bring those things up. Just ACCEPT them for who they are!! On top of that, when you love someone, you will WANT to be the best person you can be FOR them. And when that is the case, you will change YOURSELF for the better without being forced to do it! When I first started advocating the SLAP method, I had a different “P” word which I used...Promote. But when my sister told me that she wanted to add the word “PROTECT” to the acronym…to making it SLAP, I just decided to replace “promote” with “protect.” I did this for 3 reasons; 1) "Promote” can be categorized in with the “support” section; 2) “Protect” is more powerful and more needed in today’s society and 3) I would rather tell people to SLAP their partners than to SLAPP them…it might not have the same impact!! Needless to say, I can tell you that today’s couples are fighting a losing battle against the morés of our culture. Marriage is being treated with disdain, fidelity is being treated as a joke, and families are becoming extinct. Now, more than ever, we need to protect each other from the obstacles and interferences that attack us constantly. I was acquainted with a certain couple. The husband had some friends who would always belittle and beleaguer his wife in front of him…and he never came to her rescue. It was baffling to me...and to her. He never protected her. They are no longer together. He is kicking himself and wondering why their marriage didn’t work. He wants her back and she won’t have him. He did NOT protect her. Of course you know that the “protection” issue was only one of the concerns involved in their separation, but it was a big one to the wife. If you really love someone, you’ll protect them from physical, emotional, spiritual, and psychological harm (and any other harm that there may be). It’s a big order, but it is what completes that SLAP!! And I'll promote that notion to the end of my days!! 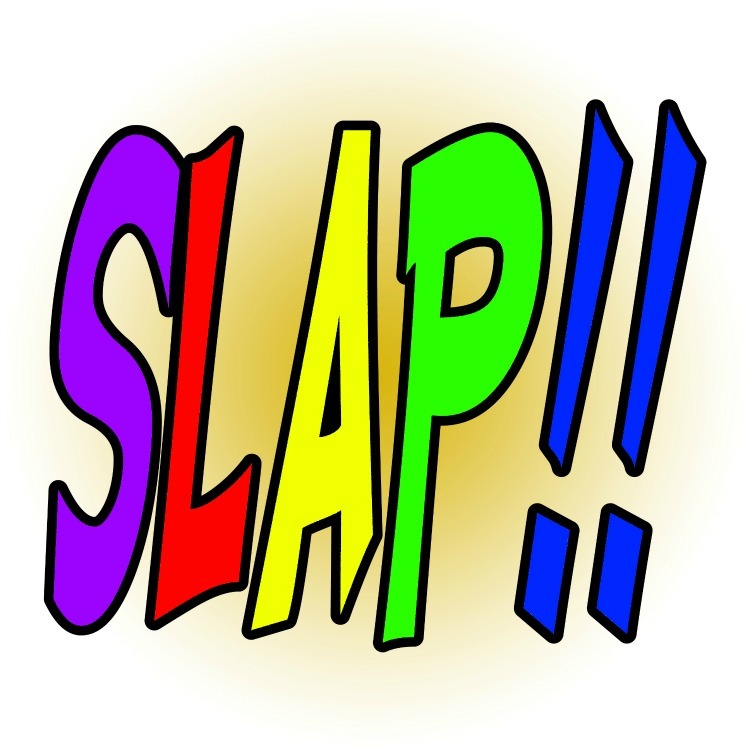 One last thing...SLAP is not ONLY intended for your partner/spouse/significant other, etc.,...you should SLAP every person you come in contact with. If everybody in the world would do that, there would be no war, or hunger, or hatred! And if you disagree, I'll SLAP you silly! !